Sometimes described as Africa for beginners, Namibia unexpectedly assembles in one place many iconic experiences: the highest sand dunes in the world; the deepest canyon in Africa; one of Africa's richest historic art sites; the world's oldest, driest desert; abundant wild life. Our trip to Namibia did not disappoint. The people are friendly with lots of laughter. There is NO rubbish anywhere, either in the towns or the countryside, perhaps because there are heavy fines for littering. Even remote rural shanties are neatly fenced and their beaten earth surroundings scrupulously clean. There is an overall air of order and prosperity. Towns like Swakopmund and Walvis Bay are well set out with an abundance of good looking houses. We were told that most properties are owned by locals although Swakop attracts a lot of German retirees. 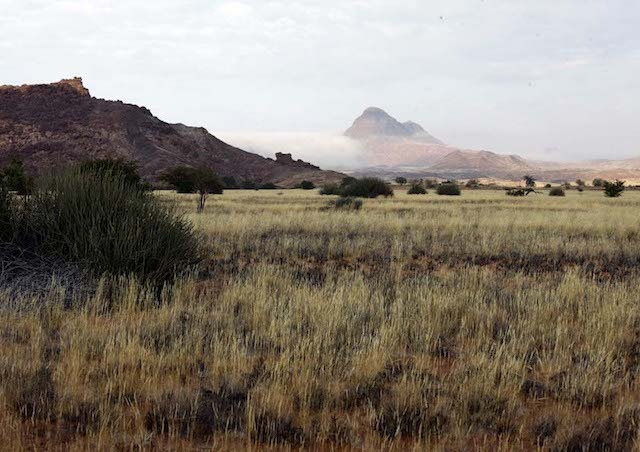 From Windhoek International Airport, we headed south-west towards Sossusvlei. Gravel roads predominate but they are wide, unexpectedly smooth and very well maintained, most coming with a 100kph speed limit. 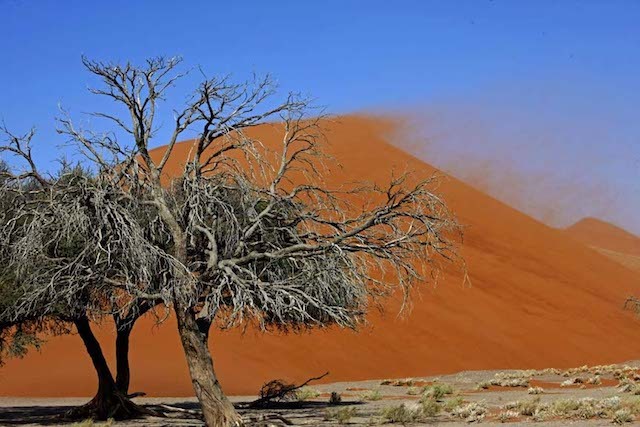 The sand dune country is iconic: Sossusvlei is a large ephemeral pan set amid red sand dunes that reach 325m above the valley floor. Unfortunately we arrived in the middle of some very strong winds - and sand and wind are not good in combination. We regretfully declined the offer of sunrise/sunset tours of the heart of Sossusvlei as both excursions meant a 90-minute plus drive in open 4X4 vehicles with wind whipping our faces ... and camera equipment! We drove on, admiring the colourful dunes along the way. Dune 45, featured on many of Namibia’s travel brochures, was approachable. It looked magnificent with a plume of sand whipping off its crest. 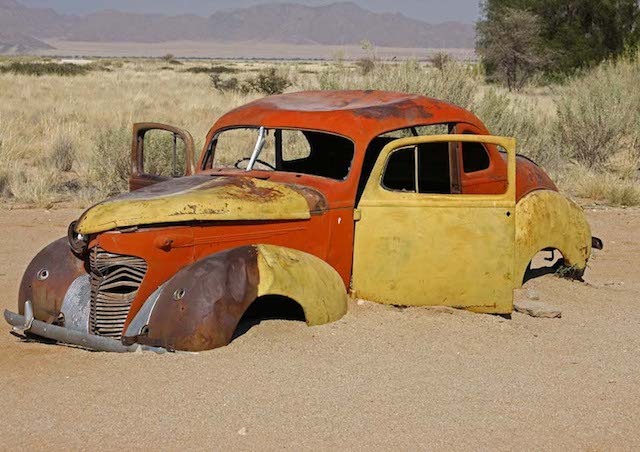 Opinions vary as to whether the Skeleton Coast gained its name from the litter of shipwrecks or from the bones that were found amid the sand. The dunes march all the way to the coast and approaching the British-founded town of Walvis Bay was akin to driving through a giant sandbox. We headed north from there to the German settlement of Swakopmund on a sealed road that separated the sea from the mobile dunes. The sand here is of the usual light colour. Swakop is pleasant enough with its German heritage evident in the buildings. We stayed at the Atlantic Villa, about 8 kms north of the town centre. ALL the accommodation in Namibia has been first class. There was no fault to be found at the pristine Atlantic Villa – and I’ve always been able to find faults in even the most luxurious accommodation. Deciding we had exhausted the town’s shopping and sightseeing opportunities within the first few hours, we elected to take a scenic flight back over the Sossusvlei dunes and Skeleton Coast. A word of warning: the pilots of these joy flights are usually young jocks trying to accumulate flying hours towards a commercial licence for an airline. We passed over a couple of ship wrecks high and dry amid the sand dunes but there was no chance to photograph them as they were gone in the briefest moment. 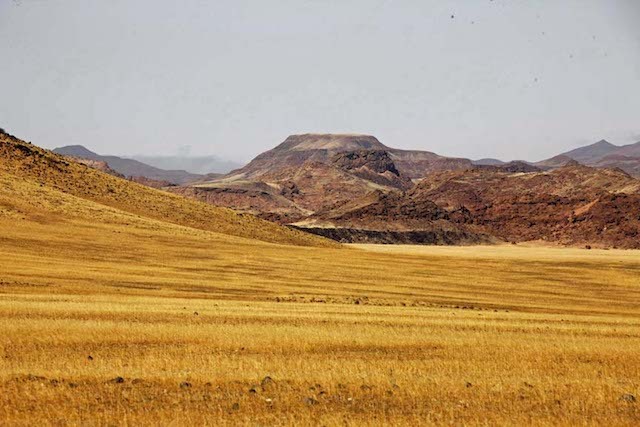 From the sandy wastes of the Skeleton Coast we headed north into Damara country, the highlight of our Namibian jaunt. The landscapes are beautiful with their subtle colouring – vast seas of wheat-coloured grasses from which amazing rock formations arise. There are enormous piles of huge granite boulders, sandstone mesas and basalt hills dotted throughout with occasional trees. 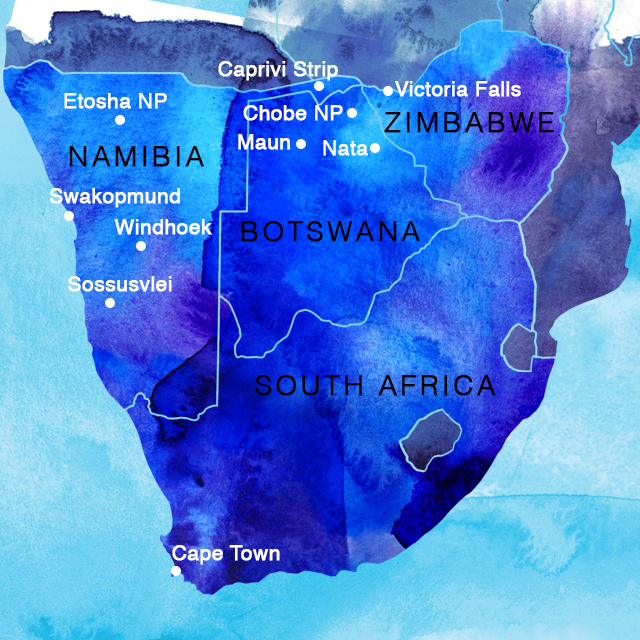 The story of Namibia's people is a complicated one of colonial settlement and oppression mixed with the culture and customs of its traditional people. 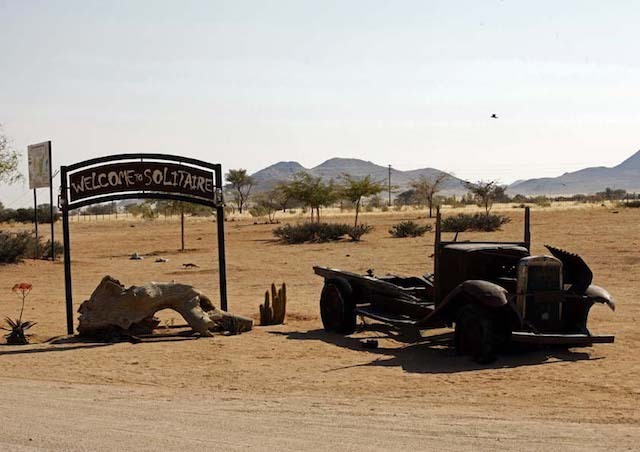 Damaraland is home to two very unusual tribes who provided us with memorable Namibian moments. The Herero ladies wear costumes based on those worn by Victorian-era German missionaries – multiple petticoats under a long dress teamed with a distinctive cloth headdress. 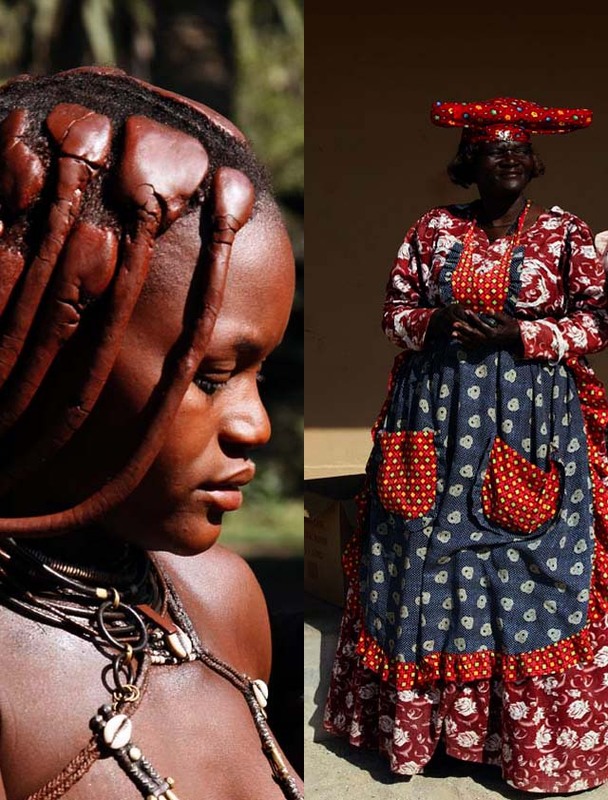 The Himba people, an off-shoot of the Herero, have gone in the opposite direction. They wear little clothing and the women cover themselves with a mixture of red ochre and animal fat, which gives their skin a reddish tinge. They also anoint their hair with the mixture. 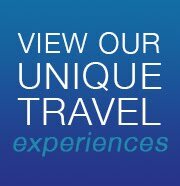 Blue Dot Travel offers small group tours to southern Africa, including Namibia safari tours. To find out more click here.